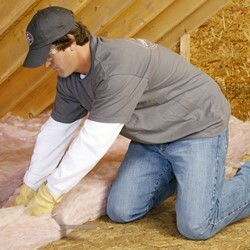 Are you looking for an insulation contractor who installs fiberglass installation in metro New Orleans or Baton Rouge? Call Mr. Green Jeans Insulation for a free estimate on affordable, energy-efficient home comfort solutions. Our service area includes all of metro Baton Rouge including Denham Springs, Walker, Prairieville & Gonzales as well as metro New Orleans including the Northshore communities of Mandeville, Covington & Slidell. There’s more to insulating a home than simply installing a product, and no modern building insulation type has stood the test of time like fiberglass. Used for nearly 80 years, fiberglass batts are still a popular building envelope insulation choice for home and business owners, and for good reason. Fiberglass batt from Owens Corning are literally made up of little fibers of glass, and by trapping pockets of air it helps keep houses cool in the summer, and warm in the winter. Owens Corning Fiberglas® Batts, which have flanges to allow for easy stapling. These batts also contain a strong vapor barrier to keep moisture out. Owens Corning High Density Batts, which are intended for 2 x 4, 2 x 6 or cathedral ceiling applications. 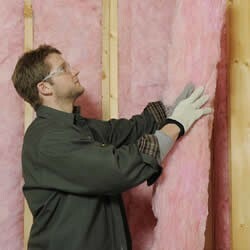 Because fiberglass is so good at trapping heat, it’s a great way to save on your energy bills. Homes and businesses insulated with fiberglass can expect lower interior temperatures during the summer, and higher interior temperatures in the winter, significantly reducing your need to run your AC or heater, respectively. Another reason that fiberglass is so popular is that it is a fireproof solution for homes and businesses. FIberglass just won’t burn, making it a great option for reducing fire hazards, though it will melt if temperatures get hot enough. Unlike asbestos which was used in years past, fiberglass is a safe solution to have in your home or business. insulation in your metro Baton Rouge or New Orleans home, versus taking it on as a do-it-yourself project. Why Choose Mr. Green Jeans to Install Fiberglass Insulation? When it comes to finding a fiberglass insulation installer in the metro Baton Rouge and New Orleans areas, Mr. Green Jeans is simply the best! With a combined 30 years experience, and having insulated over 16,000 homes in southeastern Louisiana, we’re the insulation contractor you can trust. To schedule a job or get a free estimate today, call us at (225) 644-0548 in Baton Rouge, or (504) 754-0075 in New Orleans.